Postings on social network websites such as Facebook and MySpace have been used to successfully attack law enforcement officers’ credibility in courts. 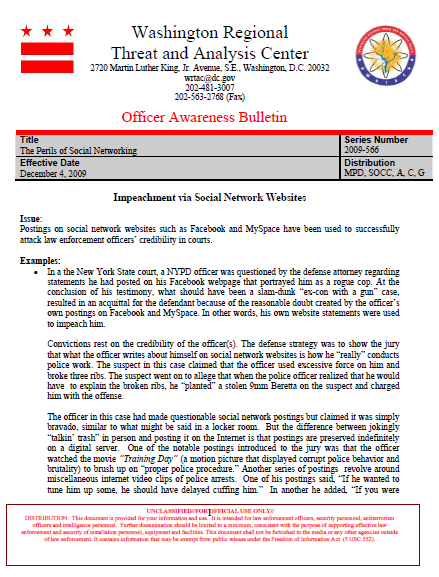 In a the New York State court, a NYPD officer was questioned by the defense attorney regarding statements he had posted on his Facebook webpage that portrayed him as a rogue cop. At the conclusion of his testimony, what should have been a slam-dunk “ex-con with a gun” case, resulted in an acquittal for the defendant because of the reasonable doubt created by the officer’s own postings on Facebook and MySpace. In other words, his own website statements were used to impeach him. Convictions rest on the credibility of the officer(s). The defense strategy was to show the jury that what the officer writes about himself on social network websites is how he “really” conducts police work. The suspect in this case claimed that the officer used excessive force on him and broke three ribs. The suspect went on to allege that when the police officer realized that he would have to explain the broken ribs, he “planted” a stolen 9mm Beretta on the suspect and charged him with the offense. In another example of poor judgment, an Indiana State Trooper foolishly posted comments on his Facebook page that were in direct conflict with the policies and procedures of his own department. In one comment he shares his views of police work, referring to himself not a state trooper, but as a “garbage man, because I pick up trash for a living.” Another comment was, “These people should have died when they were young anyway, I’m just doing them a favor.” An off-duty picture posted by the officer shows him holding a gun to a fellow officer’s head. Both officers had been consuming alcohol, which the officer personally validated when he posted that they were “drinking lots of beer” that day. Take a moment to consider the consequences of how a skilled defense attorney would use these postings to aid in the defense of their clients. In law enforcement work, there are no second chances when it comes to one’s integrity and social network postings are available for the world to see and use, even when made in jest, so think through the significance and possible consequences of all postings before you hit the ENTER Button, and preserve them on a digital server for all of eternity. “I will keep my private life unsullied as an example to all, and will behave in a manner that does not bring discredit to me or my agency”. Under Brady, evidence affecting the credibility of the police officer as a witness may be exculpatory evidence and shall be given to the defense. Indeed, evidence that the officer has had in his personnel file that displays a sustained finding of untruthfulness is exculpatory to the defense. The Ninth Circuit U.S. Court of Appeals held that “exculpatory evidence cannot be kept out of the hands of the defense just because the prosecutor does not have it, where an investigating agency does. That would undermine Brady by allowing the investigating agency to prevent production by keeping a report out of the prosecutor’s hands until the agency decided the prosecutor ought to have it…” This ruling reiterates that the investigating agency is a part of the prosecutorial team.